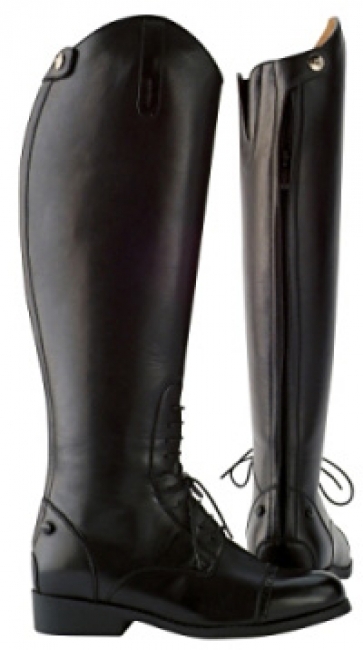 Saxon Equileather Zip Back Field Boot. Great field boot for a great low price! This zip back boot will suprise you with how well it looks and feels. Please check the available calf sizes. All foot sizes are not available in all calf sizes. Affordable all weather, washable, low maitenance with traditional leather look. Thermo Plastic Resin sole provides maximum durability and high impact absorption. Durable full lenght concealed back zipper. Fashionable high cut classical Spanish Cut top. 8 1/2 - 9 18" 13 3/8" 14 1/4" 15 3/8" 16"
9 1/2 - 10 18 1/2" 13 3/4" 14 1/2" 15 3/8" 16"
11 19" n/a 15" 3/4" 16 1/2"
Height is measured barefoot from the back of the knee to floor and add 1 1/4" to 1/2" to allow for drop. Calf measurments are around the widest part of the calf over clothing to be worn.